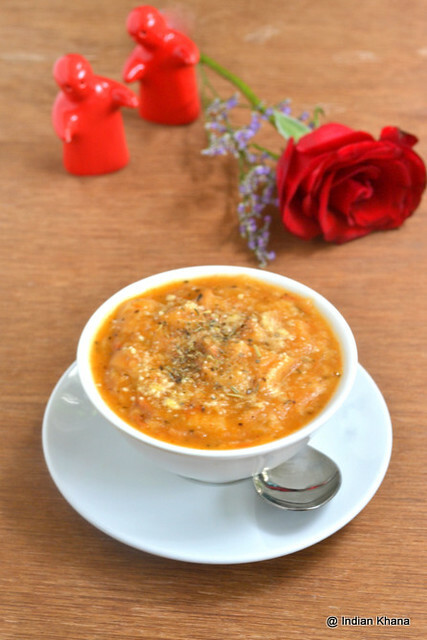 Hope you all had great start of year, I wanted to start this year with a sweet note but then I changed my mind and thought of having a healthy start with this easy and delicious soup. 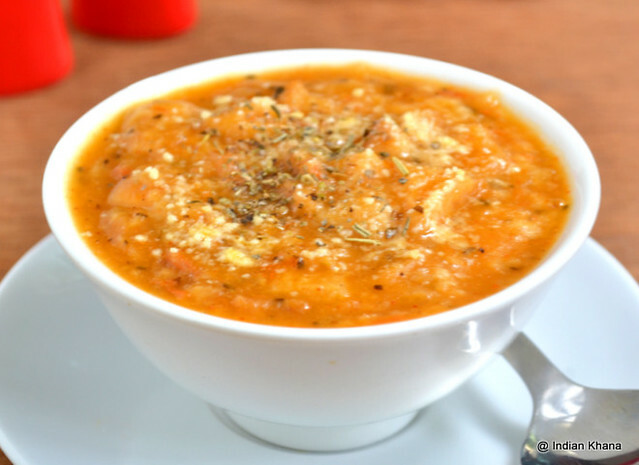 Pappa al pomodoro or tomato bread soup is one of my favorite and I always make this when I bake my wheat bread, last part of bread always transform into this delicious soup. I wanted to post this recipe for years now but never manage until I made this recently for lunch with not home made bread instead I used white & multigrain breads. 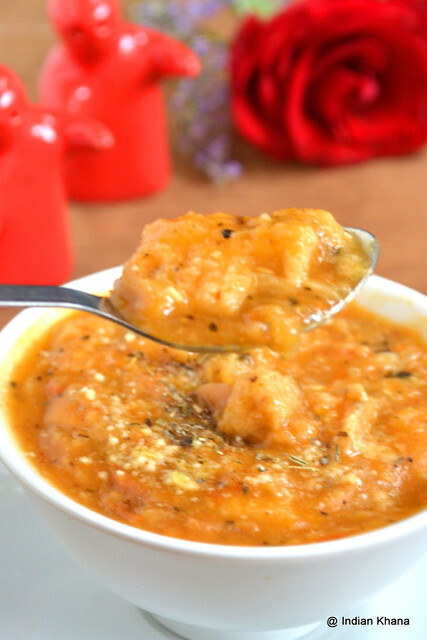 You can try this soup with any bread of your choice. 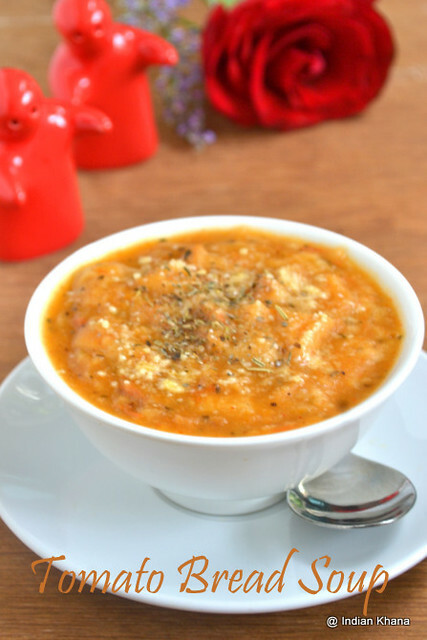 This makes delicious, healthy breakfast, lunch or dinner and if you try once you will sure love this filling soup, the plus point if you have stale bread use it for this recipe and it's a perfect winter soup - filling, warm and comfort ..what say? 1. Slice onion and chop tomato. 3. In a wok or pan heat oil add minced garlic and sauté until light brown, keep stirring to infuse oil with garlic flavor. Add onion and saute until translucent. 4. Now add tomato and cook for 2-3 minutes cover. 5. Add salt, chilli flakes mix and cook until tomato fully mashes. 6. Allow to cool and grind. We don't have to grind into smooth paste, if you like little chunky. 7. Bring soup back to pan add 1 cup of water, add tomato ketchup, herbs, pepper and bring it to boil. 8. Add bread pieces, cover and cook for 5 minutes or until bread becomes soft in medium heat. Add more water if required. 9. Adjust salt and pepper. Garnish with cheese, pepper, herbs (if wish) and serve warm. Such a filling soup, must be really tasty.. Happy New Year Priti ! nice approach to a tomato soup..
Soup looks interesting , Will try for sure !!! A perfect soup for a chilled evening. Looks delicious! A perfect soup on a cold winter evening! I would love to have this now! Happy new year wishes to you and your family.Love to have this bowl of super filling soup rite now. 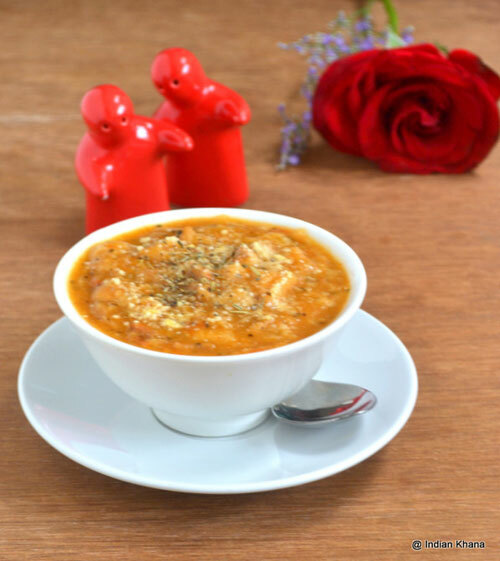 Delicious bread soup recipe, love it.